A nutritiously decadent vegetarian stew. Dice onion and carrots, roughly chop celery and kale, peel and crush garlic- set aside. Inspect lentils to make sure there are no rocks and then rinse lentils in addition to quinoa- set aside. In a large stockpot sauté onions in the olive oil until they begin to sweat, about 3 mins. Add crushed garlic and carrots and sauté for about 4 minutes. Add kale , sauté for another 4-5 minutes or until kale is softened. Add celery and thyme, sauté for another 4 mins. Crush tomatoes by hand and add tomatoes with juice to pot. Simmer for 2-3 mins- set aside. In a large saucepan bring lentils to boil in half of the broth. Once boiling, let boil for 1 minute and then lower to a simmer for 1 min. Repeat this 3 times By doing so the lentils will maintain their shape. Once the 3 cycles of boiling is done add lentils to vegetable pot. Add remaining broth and bay leafs to vegetables. Bring to a boil for about 5 mins. At this step you may need to add an additional 2-3 cups of water if water level is too low. Add quinoa. Lower heat to a simmer and cook for approximately 30 mins or until lentils are tender. Serve warm. Drizzle truffle oil over individual portions. 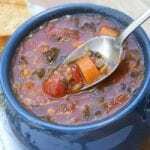 This recipe make a large pot of stew. Freeze half and the other half will allow for dinner plus lunches for the week.